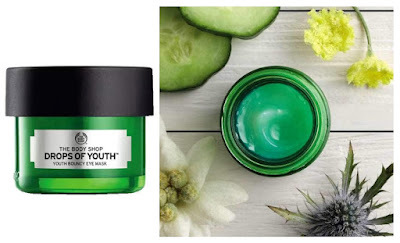 The Body Shop Drops Of Youth Bouncy Eye Mask - 20ml - $32 - with a refreshing, non-sticky formula with a bouncy, memory-shape texture that can either be applied to instantly give tired eyes an instant perk up by instantly cooling down skin around the eyes, helping to depuff bags under eyes, reducing signs of fatigue and fade dark circles or used as an overnight mask to wake up with skin that looks bounced back to a more youthful appearance, feeling replenished and appearing healthier. The 100% vegan formula is enriched with cucumber extract and Community Trade organic babassu oil from Brazil along with 3 plant stem cells: edelweiss from the Italian alps, criste marine and sea holly from the Brittany coast and contains no mineral oil, paraffin or petrolatum - and it's bouncy - what more could you possibly want? !